UPDATED ON WEDNESDAY, APRIL 17, 2019 - CURRENT POT IS UP TO OVER $72,000! Our first 28 drawings have taken place and so far, the Queen of Hearts has not yet been revealed! So, the pot rolls over and we are selling tickets each week at either campus office and at Trattoria Porretta! So far, the numbers 1, 3, 4, 6, 7, 8, 9, 10, 13, 14, 15, 16, 17, 18, 19, 24, 25, 27, 30, 32, 34, 40, 43, 44, 46, 50, 51, 52 and 54 have been knocked out…do NOT choose these numbers on your new ticket purchases! If you choose a number which has already been knocked out we will instead reveal the card with the next highest available number on your behalf. Buy your tickets weekly at Trattoria Porretta at 3656 North Central during regular dining room hours up until the time of the drawing, OR at either of our school campuses during the school day up until 10 am on Tuesday. Tickets sold at the schools after 10 am on Tuesday will roll into the pot for the following week. Tickets are $5 per ticket; SPECIAL PROMOS: buy 4 and you get a 5th for FREE! All rules, terms and conditions are listed below. Drawings will be held every Tuesdays at 7:30 pm at Trattoria Porretta until the Queen of Hearts is revealed! The ticket holder whose ticket is drawn and whose number reveals the Queen of Hearts wins half the pot! The owner of the ticket drawn each week will receive a $50 Ticket Holder Prize! Our weekly ticket winners have all been contacted. Other weekly prizes will also be drawn and they will be available for pick up from Porrettas. 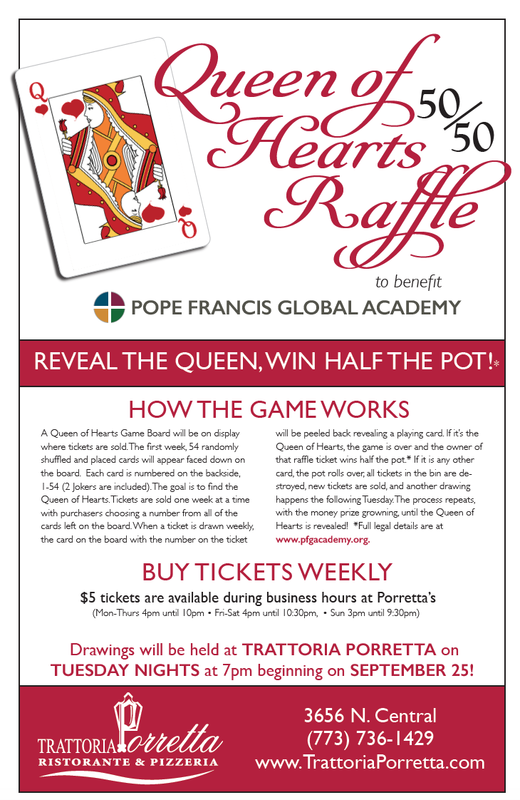 Your purchase of a Queen of Hearts Raffle ticket is subject to the Office Rules which are posted below, at Pope Francis Global Academy, and at Trattoria Porretta effective as of the date of purchase and hereby incorporated in full by this reference. If you disagree with any of the Official Rules, you must return the Raffle ticket within twenty-four hours of its purchase in order to be eligible to receive a refund of the purchase price; provided, however, that if you do not return the Raffle ticket within such twenty-four hour period, then you acknowledge and agree that: (i) you have read and understood the Official Rules; (ii) you agree to all of the Official Rules; and (iii) you will be irrevocably bound under the Official Rules. 1. Agreement to the Official Rules: The sponsor of the Raffle is the Archdiocese of Chicago’s Parish or School identified on the Raffle ticket (“Sponsor”). By participating in the Sponsor’s raffle (the “Raffle”), all entrants in the Raffle hereby agree to be bound by these Official Rules, Terms and Conditions (“Official Rules”) and by the decisions of the Sponsor which shall be binding and final as to all matters relating to the Raffle. Eligibility to win the Prize (as defined below) is contingent upon fulfilling all requirements set forth herein. The Raffle is subject to all applicable federal, state and local laws, and is void where prohibited by such laws. These Official Rules cannot be changed by any oral statement made by any employee, consultant, volunteer, or agent acting on behalf of the Sponsor. Sponsor reserves the right to amend these Official Rules upon ten (10) days notice provided pursuant to an update provided on the Sponsor’s website or otherwise published in the Sponsor’s parish bulletin or some other written medium. 2. Net Proceeds: All net proceeds of the Raffle will benefit the Sponsor in fulfillment of its religious, educational and/or charitable missions. 3. Eligibility to Enter: Only individuals who are proven to be eighteen (18) years of age or older at the time of purchase of a Raffle ticket are eligible to participate in the raffle (“Eligible Entrants”). 4. How to Enter the Raffle: To enter the Raffle, Eligible Entrants shall purchase Raffle tickets during the period set forth by the Sponsor (“Entry Period”). Each Raffle ticket may only be purchased by one Eligible Entrant and each Raffle ticket purchased by an Eligible Entrant is deemed an “Entry” in the Raffle. Eligible Entrants may purchase as many Raffle tickets as desired, subject to availability during the Entry Period. Raffle tickets may sell out before the close of the Entry Period. Raffle tickets must be paid for in full at time of purchase. Sponsor reserves the right to reject any sale of Raffle tickets due to improper payment or payment that does not constitute “good funds” in U.S. Dollars. All sales of Raffle tickets are final after any advertised return period, or if there is no advertised return period, then all sales of Raffle tickets are final upon sale. No refunds or replacements of lost or stolen Raffle tickets will be issued by Sponsor, unless expressly provided in these Official Rules. Sponsor shall be the sole judge of the validity and eligibility of any and all Entries. Entries which have been or appear to be tampered with are void. Entries by purchasers of Raffle tickets who have violated these Official Rules in any manner are void. 5. Drawing: The Sponsor shall set the maximum number of Raffle tickets forming an Entry to be sold. The winning Entry will be selected in a random drawing (the “Drawing”). In the event the Drawing cannot be conducted at the date, time, or location advertised by the Sponsor for any reason, or if a Prize cannot be awarded for any reason, representatives of Sponsor shall set a new date and location for a subsequent Drawing. 6. Prize: The Official Winner(s) (as defined below) shall receive the applicable prize identified: (a) on the Raffle ticket; or (b) on the Sponsor’s website where these Official Rules are posted (“Prize”). In the event of conflict, the applicable prize identified on the Sponsor’s website shall control. The value of any Prize(s) may be a function of Raffle tickets sold, in that a Prize may be reduced proportionally if all advertised Raffle tickets forming an Entry are not sold (by way of example, this means that if one-thousand Raffle tickets are offered and only nine-hundred are sold, the Prize(s) may be reduced by ten percent), in which case a minimum of one-half of all proceeds collected from the sale of Raffle tickets will be awarded as Prize(s). The Sponsor reserves the right to substitute any non- cash Prize acquired for the raffle for a similar prize or similar cash value when circumstances require substitution at Sponsor’s sole and absolute discretion. The odds of winning any Prize(s) depend on the number of Entries sold. 7. Notification of Official Winner: Sponsor will have the sole discretion to determine whether an owner of an Entry selected at the Drawing (the “Potential Winner”) is an Eligible Entrant and otherwise eligible to be the winner of the Prize in accordance with these Official Rules (the “Official Winner”). As a condition of its right to collect a Prize and become an Official Winner, any Potential Winner must deliver to the Sponsor: (a) a signed statement certifying that the Potential Winner is the rightful owner of the winning Entry in accordance with these Official Rules and all applicable laws; (b) such written information as is required by any applicable laws, including tax regulations, such as the Potential Winner’s name, address and social security number; and (c) proof of both identity and age in forms satisfactory to the Sponsor. Sponsor’s decision concerning the sufficiency of documentation issued to evidence the identity, age and eligibility of the Potential Winner to become an Official Winner shall be final and binding. If a Potential Winner cannot be contacted and/or notified after reasonable attempts by the Sponsor, or if the Prize cannot be awarded for any other reason, representatives of the Sponsor shall conduct another Drawing and select another Entry in order to identify a Potential Winner. Any Potential Winner need not be present at the Drawing to win and become an Official Winner. Representatives of Sponsor shall endeavor to notify any Potential Winner using the contact information provided by the Potential Winner at the time of purchasing the Raffle ticket(s). 8. No Transfer/Resale of Raffle Entries: Raffle tickets are non-transferable. Any attempted transfer in violation of these Official Rules may be voided at the discretion of the Sponsor. The lawful ownership of a Raffle ticket forming an Entry shall be determined by Sponsor based on the information collected in connection with the sale of each Raffle ticket and any other information reasonably requested by Sponsor. 9. Taxes: All federal, state, and local income and sales taxes are the sole responsibility of the Official Winner. The taxable value of the Prize will be treated as ordinary income to the Official Winner for federal and state income tax purposes. A purchaser of Raffle ticket(s) (“Purchaser”) may wish to consult a tax advisor in regard to potential tax liabilities that may arise from purchasing Raffle ticket(s) and being deemed an Official Winner. The Official Winner may be required to pre-pay a portion of any tax liability incurred in connection with such Official Winner’s receipt of the Prize before receiving the Prize from the Sponsor. 10. Publicity Release: By accepting the prize from sponsor, each official winner hereby grants sponsor and sponsor’s designees and affiliates, full permission to use the official winner’s name, biographical information, photograph, voice and/or other likeness and prize information on a royalty-free basis for advertising, trade, promotional and any other purposes in any and all media or format now known or hereafter devised, worldwide, and on the internet and world wide web, in perpetuity, without limitation, and without further compensation, consideration, permission, notice, review or approval, unless prohibited by law. 11. Disclaimer of warranties: each prize is awarded in “as-is”, “where-located” condition, without warranties of any kind and inclusive of all patent and latent conditions. The sponsor expressly disclaims any warranties, express or implied, including but not limited to the warranties of merchantability and fitness for a particular purpose, relating to the prize in any way. 12. Release of liability: in consideration of being allowed to participate in the raffle, each purchaser of a raffle ticket forming an entry hereby agrees to release and discharge the sponsor, the Catholic Bishop of Chicago, an Illinois corporation sole, their affiliates and all of their clergy, officers, employees, agents and volunteers (collectively “released parties”) from any and all liability for injuries, losses or damages of any kind (including, without limitation, attorneys’ fees) caused by the raffle, these official rules, participation in the raffle or winning any prize or resulting from acceptance, possession, use or misuse of any prize. 13. Mandatory arbitration agreement: any controversy or claim, other than a claim by sponsor, out of or relating to the raffle or to these official rules must be resolved in accordance with the below arbitration provisions. Any purchaser of a raffle ticket, including but not limited to any eligible entrants, potential winners or official winners, agrees to arbitrate any and all claims and disputes relating in any way to such purchase and/or the selection of an official winner, and/or the award of the prize, and/or the delivery of the prize and/or the raffle generally (“arbitration claim”), through binding individual arbitration administered by the American Arbitration Association (pursuant to its expedited procedures) under its consumer arbitration rules, with arbitration proceedings to be conducted in the city of Chicago. Judgement rendered by the arbitrator(s) may be entered by the sponsor in any court having proper jurisdiction. Sponsor may exercise any lawful rights to seek provisional remedies or self-help without waiving the right to arbitrate by doing so. 14. Class action waiver: all participants in the raffle hereby agree to waive the right to a court or jury trial. Arbitrators may not consolidate the arbitration claims of multiple parties. All arbitration claims and disputes shall be arbitrated on an individual basis and not as a class action, representative action, class arbitration or any similar proceeding. Prior to initiation of an arbitration proceeding under this section, anyone initiating an arbitration claim must first provide at least thirty (30) days prior written notice to sponsor, with a copy in all instances to the Archdiocese of Chicago, 835 N. Rush street, Chicago, Illinois 60611, attention: Office of Legal Services. Prior to any arbitration proceeding, sponsor must first be provided with a reasonable opportunity to resolve any dispute. The provisions of this section shall not apply to any claims belonging to sponsor arising out of or rleated to the raffle. 15. Limitation of liability: the sole and exclusive remedy for any claim against sponsor arising out of the raffle, sale of raffle tickets, awarding of any prizes or the conduct of the raffle shall be limited to the return of the purchase price paid for any applicable raffle ticket(s), without interest. In no event shall sponsor or the released parties be liable to any other party for any loss or injuries to earnings, profits or goodwill, or for any incidental, special, punitive or consequential damages, whether arising in contract, tort or otherwise, even if advised of the possibility of such damages. 16. Cancellation: each purchaser of a raffle ticket hereby acknowledges and agrees that sponsor has the right, in its sole discretion, to elect not to proceed with the raffle and/or the drawing for any reason or for no reason, and in such event, the sole and exclusive remedy shall be a refund of the purchase price of each raffle ticket purchased, without interest. 17. Indemnification: in consideration of being allowed to participate in the raffle, each purchaser of a raffle ticket forming an entry hereby agrees to indemnify, defend and hold the released parties harmless from and against any and all costs, losses, damages, rights, claims, liabilities and actions of any kind arising from, in connection with, or as a result of such purchaser’s participation in the raffle or the acceptance, possession, use or misuse of any prize. DOWNLOAD AND PRINT THE OFFICIAL RULES, TERMS AND CONDITIONS HERE.